The new ruling on explosives (Oexpl) came into effect in 2010. Since 1 January 2014, the new rules are applicable. Note that only the chief firing operator has to have this permit. The acquisition permit must be obtained from the authorities of the Canton. A communal firing authorisation is acceptable as an acquisition permit. Allows the firing of ready to fire products, including cakes and candles (it is forbidden to put shells in mortars). The maximum net weight of explosive charge in category F4 is 50 kg; supplementary products in categories F1 to F3 are authorised without limit. The maximum calibre per item is 75 mm. The transport of dangerous goods is authorised within the ADR/SDR free limit. (20 kg of net explosive charge, the 1,000 points rule). All types of category F4 products are authorised. Valid as ADR/SDR permit for the transport of dangerous goods beyond the free limit. (With compliant vehicle and authorisation). The FWA course must have been followed to be admitted for the exam. The FWB course must have been followed to be admitted for the exam. Before following the course, the candidate must justify experience of 10 firework displays including mortar shells and with a net explosive charge of more than 50 kg³. The number of firework displays is reduced to 5 if the candidate already holds an FWA permit³. The course takes place over one day with the exam on the same day. 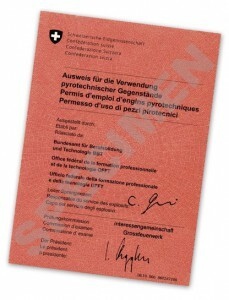 The cost is 450 CHF for the course and 50 CHF for the drawing up of the permit. The course takes place over 5 days, including the exam. The cost is 4,950 CHF for the course and 50 CHF for the drawing up of the permit. There is a (BF) permit for inside firing of specific category T2 products. A formal certificate must be obtained from the police authorities of the Canton. If the firework displays counting for experience do not reach the minimum limit of 50 kg or do not include shells, a recommendation from a Swiss company recognised by the authorities must be obtained. The validity of the permit lasts 5 years. A refresher course is necessary to renew the permit. Die Organisation der Kurse ist zentralisiert, sie steht nicht in der Kompetenz der Unternehmen.